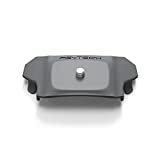 · The top can be connected to GOPRO sports cameras, 360º panoramic cameras and other accessories. · The adapter has 1/4 threaded teeth for a wide range of photographic equipment. · Note: Do not turn on SPORT mode when using this accessory. Do not charge more than 160G. · Material: ABS + stainless steel.